Can you believe Halloween is just around the corner? Have you started decorating yet? 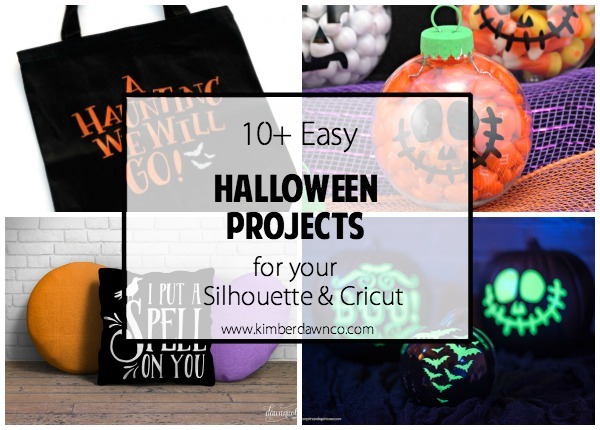 We think Halloween is one of the most fun holidays to decorate for and so here are some easy halloween projects for your Silhouette and Cricut. Whip up one of these easy projects for your Halloween decorating or gathering. These are not only beautiful they are functional! These would be perfect lining the driveway or sidewalk up to the front door! Then you can keep the spooky feel with no lights but people will still be able to see and not trip and die! How much do you love this shirt? I am not really the cool mom who goes all out and dresses up, but I would totally rock a skeleton shirt! This would also be great for the kid’s school party or something where you don’t want to be too scary or creepy! This uses glow in the dark vinyl too which would be super cool at night for trick or treating! This cut file gives you so many options. Use it to cut fabric and appliqué it onto a pillow. Or cut it out of iron on vinyl to make an adorable shirt with glitter vinyl!! The options are endless! The kids will most certainly get a kick out of this lamp! This is a fun way to decorate in the house without being too over the top or cheesy! Do you think the kids would fall for it? These are adorable for the kiddos! These would make a great gift for a carnival raffle, put the school name or a mascot as the wording and use it as a fund raiser! This is a super cute bag! Use glow in the dark vinyl so you can always see where the kiddos are when they are trick or treating! Make one for all the kiddos you know! I love these coasters! They are such a quick and easy project but they would really add some fun to a party! The image options are endless! These are stinking adorable! If you host a big Halloween party you definitely need to hand these out as a party favor! Pair them with the coaster from above to be just about the best host ever! These crows are such a simple idea but they really add a fun spooky factor! I have to say I totally adore the branches in this photo too, what a great idea to just spray paint some branches orange and make a beautiful chandelier type hanging sculpture!! These are absolutely fantastic! This is another thing I would totally do that doesn’t involve me going all out and dressing up! I love little touches like this don’t you? These are so fun! This is another project that would be great at the school carnival. Hang them from a spooky tree and let the kids take one home at the end of the night! What will you make for Halloween? Share with us in the comments below.